Contact person: Associate Professor Joakim Larsson, phone +46 (0)31 786 3589. Dr. Joakim Larsson is leading a research group within the Endocrinology Division. More information about the research group. Most of the research in the group is focused on various aspects of environmental effects of pharmaceuticals. For example, the group is part of the recently launched research programme MistraPharma – Identification and reduction of environmental risk caused by the use of human pharmaceuticals (a major research program supported by the Swedish Foundation for Strategic Environmental Research (MISTRA) 2008–2011 with SEK 44.2 million). During the period 2006–2007, Dr. Joakim Larsson and his research group worked on a project titled ”Studies of the effluent toxicity from the Patancheru Enviro-Tech Ltd plant (PETL) in Hyderabad, India to direct further actions including possible mitigations”. The project was funded by the Swedish International Development Cooperation Agency, Sida. The project aimed to investigate toxicities of effluents from Indian pharmaceutical industries in the Hyderabad region, in collaboration with local Indian authorities and organisations. As a result of the project, a paper on the concentration of pharmaceuticals in the treated effluent was published in the Journal of Hazardous Materials. The results from the studies in Hyderabad were also presented by the Indian magazine Down to Earth, in its October 31, 2007, issue. The article is titled ”Andhra Pradesh’s killer pharma industry”. Read the article. Around 90 companies in the region that manufacture active pharmaceutical ingredients, or assemble final drug products, send their waste to PETL. 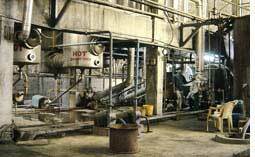 With permission, Larsson’s team sampled the waste exiting the plant; they found drugs including the antibiotic ciprofloxacin, at concentrations of up to 31,000 micrograms per litre, and the antihistamine cetirizine, at up to 1,400 micrograms per litre. The team estimated that the amount of ciprofloxacin entering the river from the plant could amount to up to 45 kilograms a day – the equivalent of 45,000 daily doses. During the 2007 Stockholm World Water Week, Dr. Larsson participated in a roundtable discussion to discuss the challenges for pollution mitigation and management in India, specifically for small and medium industries. The discussion, held on 12 August 2007, was arranged by the Bangalore-based organisation SVARAJ (Society for Voluntary Action Revitalization and Justice), and it brought together a diverse set of resource experts as well as participants at the World Water Week, and highlighted the need for technology options for effective management of industrial pollution. Now the research group is engaged in a continued project, titled ”Microbial Diversity and Development of Antibiotic Resistance Associated with Industrial Wastewater Treatment”. Abstract: Pharmaceuticals are generally thought to be released to the environment primarily through usage (excretion) and incorrect disposal. In 2007, we published a study showing another important, but up until then, largely neglected source for pharmaceutical to the environment. We showed that the treated effluent from bulk drug producers in the Hyderabad region of India release a variety of drugs in extremely large quantities (Larsson et al, 2007). The concentrations in the treated effluent of ciprofloxacin, a powerful broad spectrum antibiotic, exceeded levels found in the blood of patients taking this drug. The amount released during one day at one site corresponded to the total use of this drug in Sweden over five days. We are seriously concerned about the environmental impact of such high levels of drugs and antibiotics, exceeding levels found in normal sewage effluents up to 1,000,000-fold. In addition to the expected ecological damage downstream from the discharge, there is an apparent risk that such high concentrations of antibiotics can contribute to an accelerated resistance, an issue of global concern as resistance bacteria often spread rapidly once they have developed. We have started to pursue the occurrence of resistant bacteria in the effluent together with scientists from University of Pune (Prof. Y Shouche) and colleagues at Göteborg University (Prof. E. Moore and M. Hermansson). We are also looking into effects of the effluent on rats (own work), fish (own work and collaboration with Dr S. Örn at the Swedish University of Agricultural Sciences, SLU), frogs (SLU), and natural bacterial communities (Dr. T. Backhaus, Göteborg University). Furthermore, we are studying the fate of the pharmaceuticals in the environment in India together with the University of Umeå (Drs J. Fick and H. Söderström). In Hyderabad we have received invaluable help from the local organization Gamana. In November 2008, the project was given SEK 750 000 as a three-years research grant for the period 2009–11 from the Swedish Research Links programme (funded by Sida and the Swedish research Council). The main applicant was Dr. Edward Moore, Institute of Biomedicine, Sahlgrenska Academy. More information on the Swedish Research Links grants 2008. The Indian PhD student Nachiket P. Marathe is working at Gothenburg University from October 25, 2010 until January 25, 2011, as part of this project. Nachiket works with Prof. Larsson’s and Prof. Moore’s groups for his exchange. The primary focus of his work will be in Prof. Larsson’s group, where he joins on-going metagenomic analyses that are assessing the impacts of antibiotic pollution from a waste-treatment facility in Hyderabad. Prof. Larsson’s group has shown previously that antibiotic contamination released from the treatment facility is the highest reported, world-wide. Additionally, Nachiket has obtained an extensive collection of bacterial isolates from sampling sites affected by the waste-treatment facility and has carried out initial physiological and genotypic characterizations within the group of Dr. Shouche. With Prof. Moore’s group, Nachiket works to further characterize the bacterial strains, for their antibiotic resistance profiles and other phenotypic, as well as genotypic traits. The initial analyses have indicated that bacterial isolates exhibit marked increased resistance to a range of antibiotics. These studies included planned assessments of the levels of antibiotics in drinking water in villages in the vicinity of the waste-treatment facility. Full information about the project. In 2011, Dr. Larsson was awarded funding for another project involving Indian cooperation entitled ”Does a high level of antibiotic pollution increase risks for mobilization of resistance genes from the environment to the human microflora – exploratory studies including deep sequencing”. This project is funded by the Swedish Council for Environment, Agricultural Sciences and Spatial Planning (FORMAS) and will run in the period 2011 – 2013. Abstract: Increasing frequencies of multiresistant pathogens is a global problem accelerated by our heavy use of antibiotics. As bacteria and bacterial genes often are mobile, the external environmental may serve as a reservoir of resistance genes to human pathogens. We have recently demonstrated unprecedented pollution with broad-spectrum antibiotics in India with potential implications for resistance development. The main questions to answer within the VR and FORMAS projects are 1) How does a high and persistent environmental antibiotic selection pressure affect the abundance of resistance genes and genetic elements promoting their mobility? 2) Can we find evidence for a role of environmental antibiotic pollution in the transfer of resistance genes to the human microflora? 3) Can we explore the environmental microbiome to identify novel resistance genes that we may face in the clinic tomorrow? High-throughput DNA sequencing of isolates and complex bacterial communities, in parallel with traditional microbiology, will be used to genetically and functionally characterize resistance factors in bacteria from river sediment, soil, drinking water and human faeces from highly antibiotic-polluted Indian environments and reference sites. Science-based evidence of the consequences of antibiotic pollution, as those generated here, could provide strong incentives to reduce antibiotic selection pressure on environmental bacteria in order to protect public health. In January 2009, the results from Dr. Larsson’s and his team’s continued research around the Patancheru Enviro-Tech Ltd plant (PETL) in Hyderabad were presented in a scientific report that shows how the pharmaceutical effluent from the PETL continues to have serious adverse effects on the environment. The findings raise concerns for the health of wildlife and ecosystems in the region, as well as underscoring little-studied potential effects on human health. Studies have been made on tadpoles and zebrafish embryos exposed to diluted PETL effluent, equivalent to river water downstream of the plant. At the lowest concentration tested – equivalent to 1,500 cubic metres of effluent diluted in 750,000 cubic metres of river water, or a 0.2% concentration – the tadpoles experienced 40% reduced growth compared with controls. And at concentrations of 8–16%, zebrafish embryos lost colour and movement within two days of fertilization, among other developmental effects. The report was presented in the Nature Magazine published on 4 February 2009. ”India’s drug problem. Chemists show how waste-water contamination affects ecosystem”, written by Naomi Lubick. Read the article in Nature. It was also highlighted by the Associated Press (AP) news agency. Its medical reporter Margie Mason wrote an informed article from Patancheru, titled ”World’s Highest Drug Levels Entering India Stream”. The article was illustrated with photos by Mahesh Kumar. Read the full article as it appeared in ABC News on 26 January 2009. The effect of the AP article was phenomenal. The article soon appeared in many leading newspapers all over the world, including the New York Times and Washington Post. According to Yahoo News it became the most read news item on the day they published the article, and according to Google it was soon republished on more than 2 million web pages. In India, the Times of India took up the thread, and wrote several articles on the issue, front page articles that gained wide attention in the country. 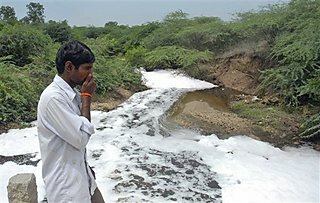 The paper revealed that after the publication of the shocking report, the office of prime minister Manmohan Singh had asked the local pollution board to start collecting data on pharmaceuticals in Patancheru’s waters immediately. The government is troubled by the tag of India being host to one of the world’s most contaminated spots and the initial reactions of officials indicated that they did not feel the study was inaccurate. The report comes at a time when the Centre is moving to tighten norms for environmental clearances by calling on industries to make ”verifiable disclosures” when setting up or running factories. Industrial units will be required to make declaratory statements on their environmental commitments by way of issuing advertisements and putting up relevant information on their websites. In the case of Patancheru, the government’s task will begin with first getting hold of the type of environmental clearances granted to drug factories, said to number close to 90, in the area. Only when this is clarified will the investigation proceed to the next step of zeroing in on the nature of violations by factories and then look at the culpability of both private entities and officials. More information in Times of India article from 28 January.